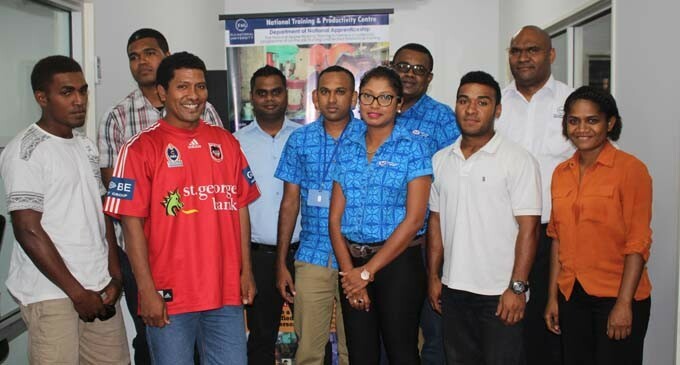 Five students from the Fiji National University’s National Training and Productivity Centre’s (NTPC) National Apprenticeship Training Scheme have signed on with FMF Foods Ltd for the next four years. The five apprentices who have signed on are in the Trades of Electrical Engineering and Plant Maintenance programme. Director NTPC Isimeli Tagicakiverata said through the apprenticeship scheme there was a better balance between theory and practice. Students not only received on the job training but they would continue with their theory classes as well. The director expressed his appreciation to FMF for signing on the five apprentices. He highlighted that one of NTPC’s agenda was to support the industry and capacity building. “The Apprenticeship scheme is a very good scheme, something we are supporting at NTPC. “And I think we owe it to the industry as they are investing so much in terms of time, supervision and finances on our young people and it’s only fair that we give back that same dedication and commitment to the kind of quality that we put in to our work,” Dr Islimeli said. Dr Isimeli said NTPC would like to see more females joining the apprenticeship scheme. FMF Operations manager Jimi Taniela commended NTPC and the national apprenticeship scheme for the partnership. “As a former apprentice it is a positive note to see more students joining the scheme,” Mr Taniela said. Manager National Apprenticeship Scheme Reenal Chand said there were more than 50 Organisations who are currently training apprentices in Fiji. Mr Chand said the apprenticeship agreement allowed apprentices to not only gain theory knowledge but also practical as they worked. He said the apprenticeship contracts were different to the normal employment contracts. Some of the organisations include Goodman Fielder, British American Tabaco, Natural Water of Viti Limited, Carpenters Motors Limited, Asco Motors Fiji, Niranjans Autoport Limited, Fiji Sugar Corporation Limited, InterContinental Fiji Golf Resort & Spa, Lincoln Refrigeration Limited, Vatukoula Gold Mines Ltd and many more.